The Finishing Touch: New Spring Designs! 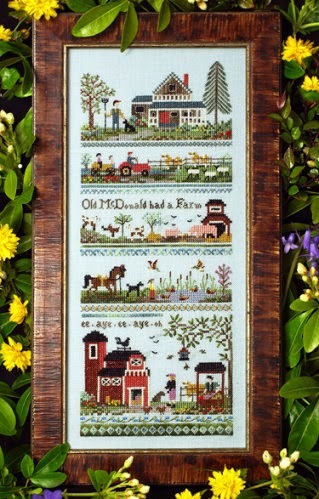 Victoria Secret’s “Old McDonald’s Farm Sampler” is a darling sampler showing McDonald himself with a collection of the cutest farm animals as well as the McDonald farm house. Also from Victoria Sampler, “Laughing in Flowers,” shows a collection of beautiful flowers. 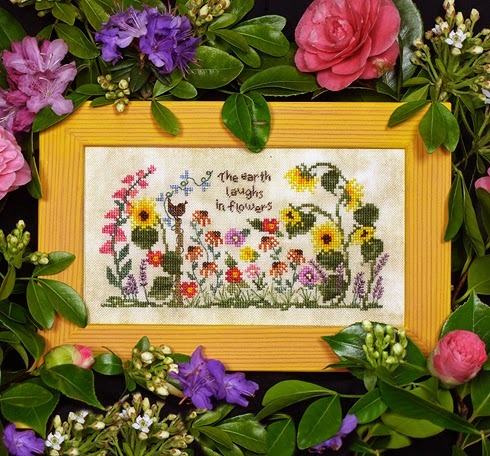 This sampler is full of gratitude for our garden blessings. 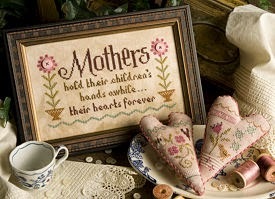 Comes with thread pack with overdyed silks and cottons, plus beads and buttons to enhance the scene. Little House and Classic Colorworks have presented a new series of three designs called “Sun, Moon and Stars.” The first design is “Over the Moon” as shown. Package includes graph and overdyed fiber package. Second in the series is “Beneath The Stars” – coming next month. What a fun series! 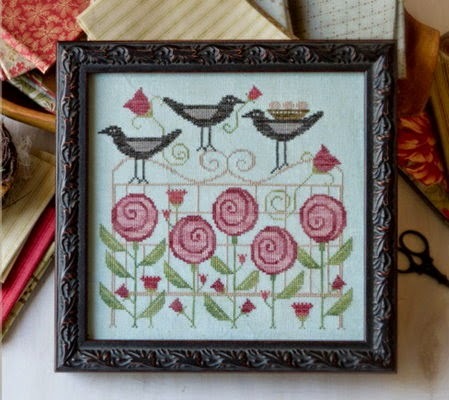 Great little sampler from Plum Street Sampler is “Trellis Blackbirds.” Design features whimsical pink flowers being watched by stylized blackbirds. Great spring sampler addition. Linda Ebright, of Lizzie Kate, has been a woman on a mission. First up is a set of 12 Halloween designs called “Tingles.” This is a set of Flip-Its being introduced three cards at a time. The photo shows the complete set put together as a sampler. Too cute! Two additions to the String Snippet Series – Doggy String Snippet and Kitty String Snippet. The photos say it all. 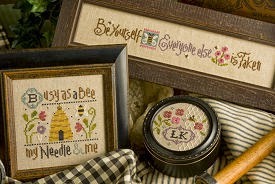 There are two Chartpaks: one is a set of designs especially for Mother and the other is Busy Bee Chartpak showing Busy As A Bee sampler and two other designs. In addition to the many wonderful designs listed, we are pleased to have a trunk show from The Heart’s Content. This show will arrive mid-May and we will let you know the exact date. 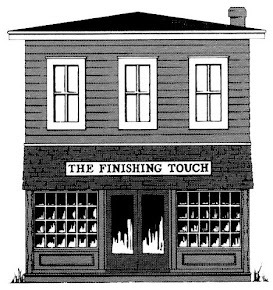 A note of thanks to all of you who have welcomed The Finishing Touch back to the needlework community. Our May special is 10% discount on any fabric purchased during the month of May. We hope to see you soon.